The 9mm Glock 17 is the most widely used law enforcement pistol worldwide and is one of the best selling handguns to civilians in the USA. New Gen 3 + 4 G17 for Sale. Firearms must be shipped via Fedex Overnight to your selected FFL. This is a flat rate, $40 charge which includes insurance. 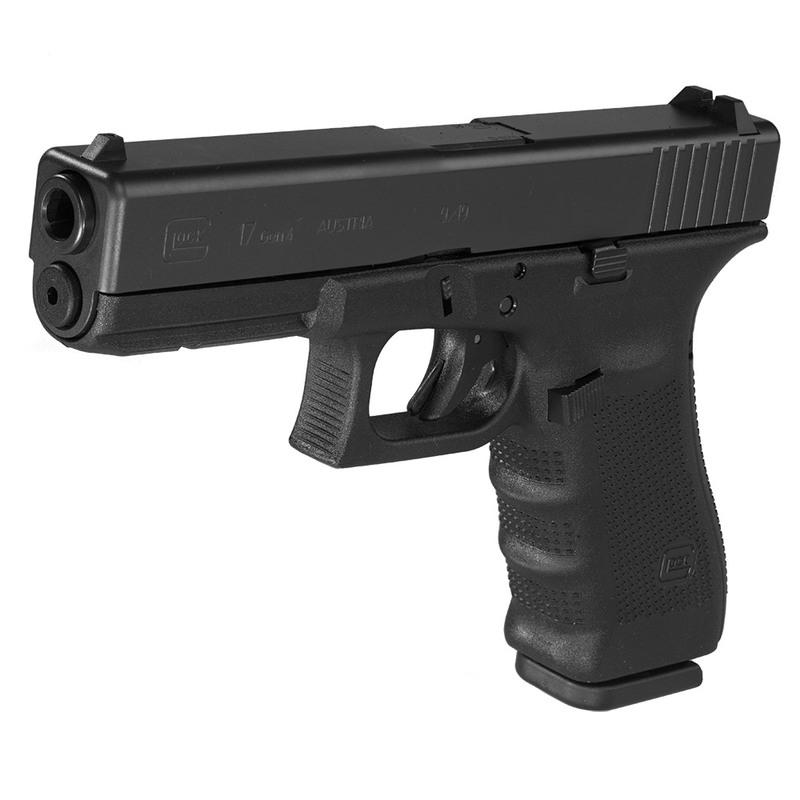 The 9x19mm Glock 17 is the most widely used law enforcement pistol worldwide and is one of the best selling handguns to civilians in the USA. Because of its unsurpassed reliability, above-average magazine capacity of 17 rounds and its low weight, it is trusted by law enforcement officers and security professionals worldwide. It is safe, easy and quick to use through the revolutionary "Safe Action" trigger system. Glock 17 - designed for professionals. Standard Gen3 models come with two, 17-round magazines. Gen4 models come with three, 17-round magazines. CA/HI/MA/NJ/NY models come with two, 10-round magazines. Gen 4 models are currently unavailable for purchase in California except for certified law enforcement officers. The original is still very nice come Gen 3, my wife and I had a great time with it out of the box. Forgiving and somewhat simpler it doesn't require anything much to perform very well. 2k rounds with a Tungsten guide rod feel strong and with a set of aftermarket sights likely a longer distance gun. Easy to learn with not to big for anyone except the smaller conceal figures. I bought a gen 1 17 in the late 80s early 90s. I've put countless rounds through it and it works like a champ every time. I have multiple pistols. But it's my concealed carry piece and my goto. Use the Glock 17 for backup...Hooah! Great pistol. Taught my wife to shoot with this gun. She fell in love with shooting and with Glock. Glock 17 king of guns. The Glock 17 Gen 4 is my EDC that I trust my life with against someone who may be trying to end mine. What great comfort it is knowing I have a Glock 17 on my hip. I work eat and sleep with my Glock 17 Gen 3 ! Best sidearm ever made in my book ! Easy clean , load . Buy yours today ! Don't forget to purchase two more magazines . This is one of the best 9mm Pistols. I know there are many, and the Glock 19 is #1 in rhe U.S., but the lightweight, thin, conceilable full size 9mm Glock 17 Gen 4 feels great with a backstrap including the beavertail because NATO FMJs are nice practice and not garbage. High.pressure for affordable practice ammo. I usually use NATO 239 grain .45 acp Glock 21 models, but this is my 2nd favorite. Haven't tried the Gen 5 yet, and I'm generally more comfortable with Gen 4 duty sized Glocks. A better recoil assembly may help with any FTE or erratic ejection issues. Possibly the finest poly pistol ever! Look how many LE agencies throughout the world trust the Glock 17. You don’t get that type of endorsement without getting the little things right! The reliability of the G17 is unquestioned; so what’s not to like? Ugly pistol? Check. Not the cleanest or lightest trigger break on the market? Check. The original “plastic” pistol? Check. Front and rear factory sights that are...ummm?...not the greatest? Check. Goes bang every time and puts the rounds on target like a champ? Check to that, as well. Survived and actually flourished during years and years of torture tests applied by many different agencies, police departments and militaries? That, too, would be a check. If you’ve never trusted your life with a Glock 17, you can never truly appreciate the comfort so many experience, law enforce and civilians alike, by having it by their side. Get one. You’ll see what I mean.